Christians face depression, just like other people out in the world. One of the best things we can do is face the lies that are told to us while we are depressed and use God’s strength to tackle depression heart on. The reason why I say “heart” on is because out of the heart are the issues of life (Proverbs 4:23). Our thoughts are not from our head, they are from our heart. We are taught from the Bible that words and actions originate from the heart (Matthew 5:18,19). 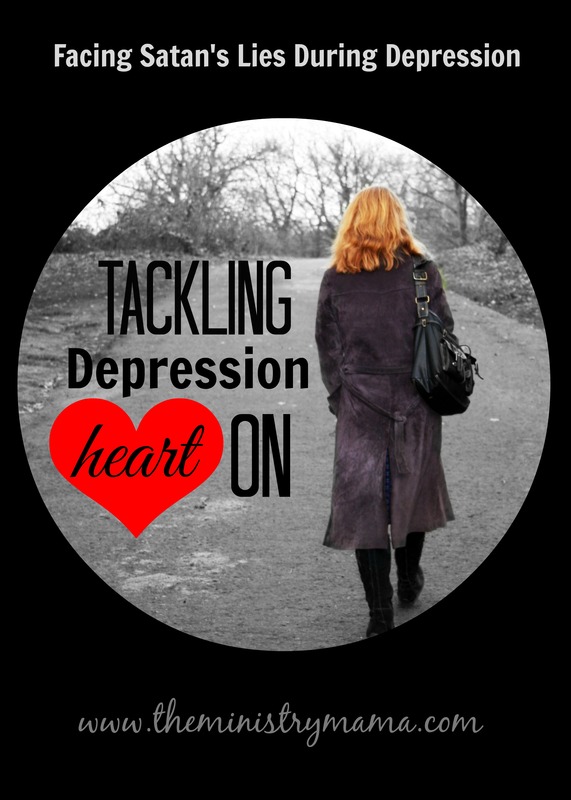 To tackle depression, we need to tackle the heart of the issue. Depression is nothing new to me, my first problems with depression surfaced in my high school years every September. It began with being involved in a relationship that I should not have been in, and the result of my having to break up with my boyfriend. The next year it was something else, then it was the transition to Bible College, then a bad break-up with a scary boyfriend, the cycle continued yearly. I dealt with Postpartum Depression after our sons were born and it took almost a year to be able to adjust to life. In those low situations, I became the prime target of Satan’s lies and pinned down by them. Depression just held me like a straightjacket, making me unable to deal with life for weeks and months at a time. 1. Do not ask for help. 2. You are the only person around you going through this. 3. You need something bigger than you to help you. 5. You should end your life. 6. Run away, it will be easier. 7. People do not notice because they do not love you. 8. Stay away from people. 9. You are not saved. 10. God is silent to you because you are in sin. It would be easy for me to take each of those lies and turn them around in a positive self-help sort of way and make you feel like you should be stronger than you are in these vulnerable moments. But my hope is to help you use the Word of God to be able to fight against the lies of the devil. 1. Ask for help. Talk to your spouse and family about how you feel. Go to your doctor, some depression is caused by medical conditions. Ask others for prayer, read James 5:13-16 where you see that prayer for others makes a difference. 2. You are not the only person going through depression. The Bible says in Ecclesiastes 1:9, there is nothing new under the sun. If there is nothing new under the sun, then the Lord has been helping people with depression for thousands of years. Read about how God ministered to Elijah in I Kings 19. 4. You are priceless, because God loves you. We love him because he first loved us. I John 4:19 He values you enough to allow His Son to die on the cross for your sins. You’ve probably heard it said, if you were the only person on this earth, Jesus would have still come to die for you because He loves you. He knows the hairs on your head (Matthew 10:30) and keeps the tears of his children in a bottle (Psalm 56:8) because you are priceless to Him. 7. There are people in this world that love you. People may not notice your struggle with depression because they are selfish or they do not know how to cope with your depression themselves, not because they do not love you. There is always a handful of people in your life that love you so much that they would go out of their way to be able to help you. Reach out to one of them you trust and share your feelings. 8. Get around people and make a choice to minister to them. Depression and even grief may keep you out of the action of the game of life for a while, but it should not keep you out of the stands of life. It is okay to be a bystander temporarily, but at some point you should focus on maintaining relationships and caring for other people. When you are depressed often you dwell a lot on yourself, being around others allows you the opportunity to meet the needs of people around you. Mark 10:45 For even the Son of man came not to be ministered unto, but to minister, and to give his life a ransom for many. 9. Are you saved? The Bible says we need to work out our own salvation in fear in trembling (Philippians 2:12). Not everyone that names the name of Christ is a true believer on Him. In the day of judgment there will be people that God says, “Depart from me, I never knew you…”(Matthew 7:22,23) Depression can be an indicator of the spirit within you recognizing the void you have being separated from God. Sin in our lives separates us from God, when we are unsuccessful through good works to appease God then the void of not having a complete sense of being is magnified. Many people try to find substitutes to fill the void they are sensing which can lead to depression and addictions. When the substitutes still leave a void of emptiness then increased depression or the next steps of higher or greater addictions will begin to be used to replace it. If the person does not realize the peace of God through salvation, then they may plunge deeper or have prolonged depression that begins to effect the entire body. I like to explain it like this. Savior means rescuer. We need someone to rescue us from our sins because we cannot save ourselves. Salvation is a complete belief that Jesus was that Savior. He died on the cross taking all the sins ever committed by man upon Himself so we would not have to pay for our sins in hell for ourselves. The belief must include that Jesus rose again 3 days after He died conquering sin and death. (Romans 10:9) Salvation also includes repentance (Mark 1:14,15), which is turning in your heart from sin that you love as an unbeliever to belief in Jesus Christ and changing your life and be obedient to God’s instructions in the Bible. When you call on God it does not mean your circumstances will completely disappear, it means that you have peace with God that now your sins are forgiven, you can feel a sense of completeness. Then it is your responsibility to begin to learn from the Bible how God wants you to live your life. If you have made the decision to trust Christ, then salvation does not leave you because you are going through a depression. God holds His children in His hand and nothing can pluck them out (John 10:28). 10. Sin is not always the reason for depression, but sometimes it is. Some people say, “God is silent to you because you are in sin…” I do not know your heart so I cannot say whether you are living in sin or not. If you are unsaved then you are living in sin (Ezekiel 18:20), if you are saved then your personal choices determine whether you are in sin or not (Romans 6:6). The consequences of sinful choices can cause problems in our lives that bring about a depression. Other times our reaction to circumstances cause depression. Finally, other times it is medical. I believe that most depression is a physical and emotional sign of a spiritual problem. You can simply ask God to show you if you have sin in your heart and life, when and if He reveals it, then it is time to confess it and make your heart right before Him. Psalm 139:23,24 Search me, O God, and know my heart: try me, and know my thoughts: And see if there be any wicked way in me, and lead me in the way everlasting. God also uses silence sometimes as a test of our faith and obedience. The Conclusion is: Cry Out To God!! The righteous cry, and the Lord heareth, and delivereth them out of all their troubles. Psalm 34:17 God is there, please allow the words from the Bible to speak the truth to you so that you do not slip from depression into a self-hatred or a suicide attempt. Lies will defeat you, but the truth will set you free!